Out of the four of us, my wife Julie has to be the most nervous when it comes to shooting critters. This is typical for her, she is always nervous at first but then seems to slam everything she shoots at. That's what the boys were telling her as we headed back to blind #4 again. Seems now that they both put the smack-down on their hogs, they've becoming little shooting coaches ready to assist mom through the jitters. There are two fixed ground blinds at Shiloh. The one we like the best and have been hunting is blind #4. It is larger with more windows. It's also in a little valley next to a river. This makes it a bit cooler than the other blind which is in the sun. 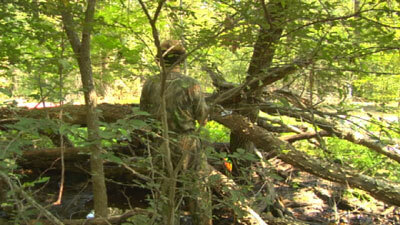 But I couldn’t help but think that we’ve been overhunting this blind the last two days and my fears were right on. For most of the morning we watched hog after hog appear from either direction of our blind. But they had a comfort zone. They'd feed within 30 yards but no closer. As Matt Napper put it; it was like one of them snapped a plumb line which the others wouldn’t cross. After two hours, I knew this blind was useless. So rather than head back and try a different blind, I asked the kids to stay put while Julie and I worked out a strategy to trick the hogs. The wind was perfect for a set up along the east end of the dirt road. Julie found a blowdown to hide behind while I headed back into the brush on the opposite side of the road. I set up my camera for a reverse shot angle and waited. When the hogs appeared I realized I had a problem. 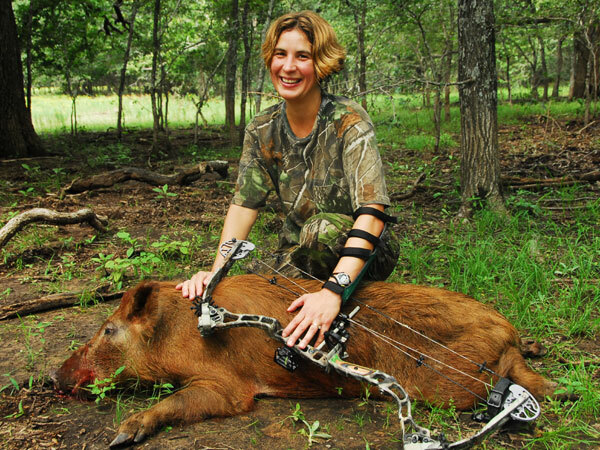 If more than one hog appeared within Julie's range, I'd have no way of knowing which one she'd shoot. 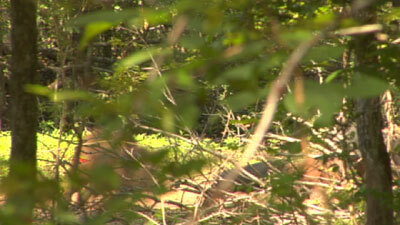 I had also moved deeper into the brush with only a few clear angles to the road. I had not realized this until a big red hog gave Julie a decent shot and she took it. I was unable to capture it clearly on video. I think she was fine with it, she hates being on camera. 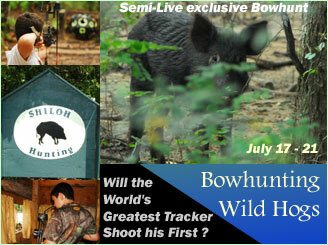 But unlike the boys' shots which we captured clearly on video, we couldn't tell just where her arrow hit the hog. And in the fog of excitement, Julie was unsure herself. The boys ran down after the shot and we started to piece things together. We did not have the arrow but we did find a bloodtrail. It was sparse. Luckily, Matt and Cheryl brought little Sage down to assist with tracking. The little dog was amazing, Julie's hog went a long way. As it turned out, Julie hit her hog too far back and there was very little blood. The dog saved the day and Julie got a nice red hog from Shiloh! She was happy and so were we. The entire family is tagged out except me. It is also around 100 degrees and too hot for a blind. So after lunch we’re going to try an ambush just like we did in 2005.